I didn’t get any this year:( My mom has a great chocolate zucchini bread recipe that I LOVE! Also zucchini cake with cream cheese icing, and regular zucchini bread. She is also famous among our family and friends for her zucchini relish. Let me know if you want any of the recipes! I also have a terrific chocolate zucchini bread recipe. Hi Lorelei – I would love to see your chocolate zucchini bread recipe too. If you can, post it here for others to see as well. I tried planting zucchini because of all the amazing recipes that exist. I ended up misorganizing my seedlings and we had a frost that killed much of what we had. I planted more seeds… However, when the plants that made it to the garden began to fruit we had not a single zucchini. we had TONS of lemon cucumbers and yellow crook neck squash. Needless to say I wont be growing either of these this coming spring. I couldn’t find a good recipe for the squash except for a crook neck and red potato with goat cheese gratin. It was good but I so wished for zucchini. No preserving of my fall harvest this year because I am way too pregnant to do much. I also have never preserved before. I love your shredding idea and look forward to hearing what others have to say. Hi Nature Chic – Don’t give up – try growing zucchini again. Maybe get some new seeds to start with. You are right, there are a ton of wonderful recipes out there. The goat cheese gratin you mentioned sounds wonderful. Would you share the recipe? Here is the website I found the squash, red potato and goat cheese gratin recipe at. I hope this will pop up as a link. I loved it but next time I would cut the squash thicker than the potato so that i can have some crunch in the squash and not the potato. You outsmarted the squash bore!! *hysterical* We should probably try that. We’ve had trouble with them the last couple of years. They usually kill the plant before it produces any blooms (which are quite tasty too). I usually prepare the zucchini with other veggies. My husband likes them julienned and with carrots, onion, potato and celery. I season them with garlic, salt and paprika. It’s nice as a side or scrambled with eggs in the morning. Hi Clara – talking about food makes me hungry too! Right now, my favorite way to prepare zucchini is to slice and grill them brushed with olive oil. Up until a few years ago my main way to prepare them was diced with onion and any other veg around and saute them. I like your mixture with the carrots, onion, potato and celery. YUM! Hi Mrs. WabiSabi! My hope is that the squash vine borer is busy with other things to think about making the trek over to my neighbors garden. The evil winged creature has the capability to travel and I am just thankful that they haven’t made the trek yet. So far so good. I have 6 more zucchini sitting on my counter and the plants look incredibly healthy and happy next door. I don’t want to be overconfident, just thankful at this point to have something to harvest other than peppers. I’m so jealous! I was having a HUGE turnout on mine and then the squash borers ruined EVERYTHING! Hi JessicaCRB – I am so glad you were able to harvest something from your plants before you were hit. Mmmm! 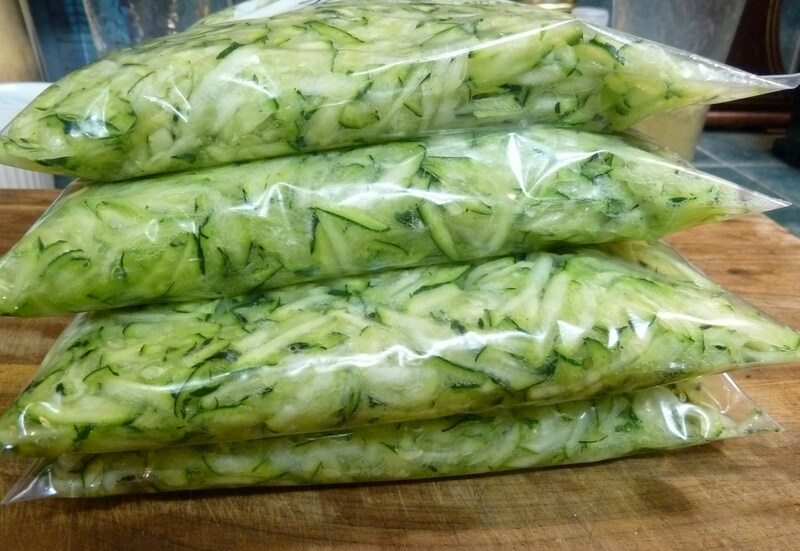 I love zucchini (or courgettes as I know them) and could eat them every day! 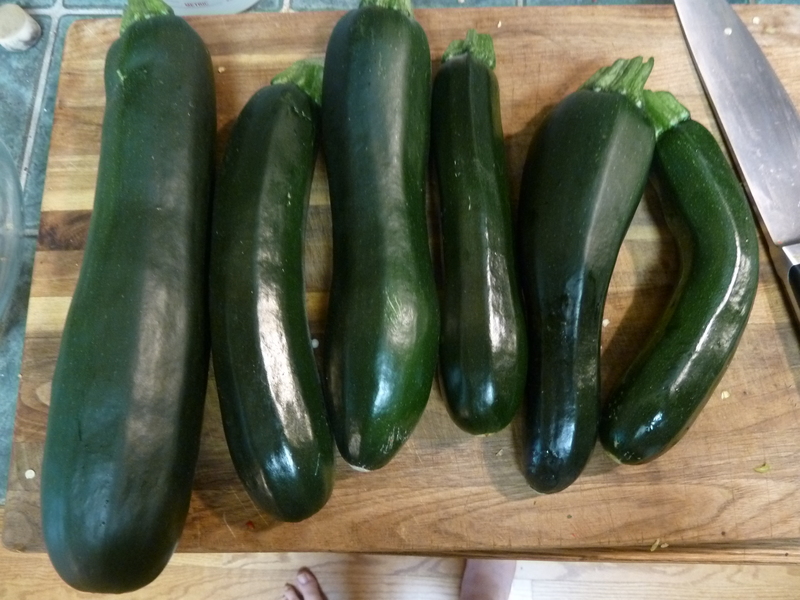 Hi Liz – ah, yes, courgettes (zucchini!) I chuckle when I think of that. I must have been thinking/writing in American English when I wrote this. A zillion years ago (or so it seems) when traveling, I learned there is more than one way (in English) to say the same thing. Thanks for the reminder and bringing up some great memories for me.